I’m so very excited about this race that I will try not to let my excitement get the better of my race review but it will be difficult. 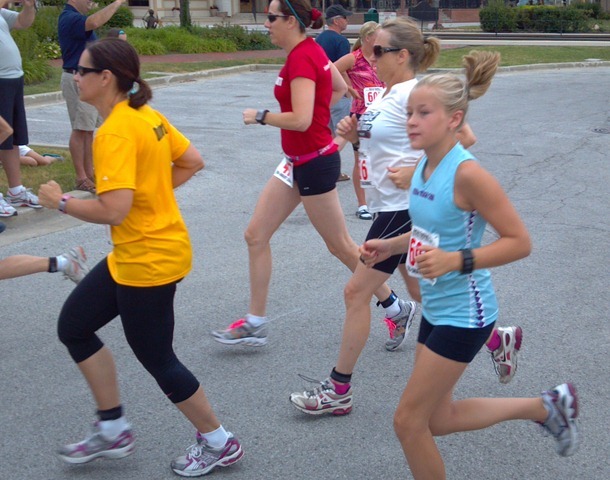 The Race Around The World Duathlon takes place in Tinley Park, IL each year on the third Sunday in June. My theory as to the name is that we race around a music complex that used to be called the World Music Center but that is certainly my own speculation, please don’t take it as fact. The duathlon consists of a 2 mile run, 11 mile bike and finishes up with a 2 mile run. A duathlon is always a run, bike, run event for any of you who don’t want to get wet. It’s possibly my favorite event of all times. I’m normally a strong runner, and I’m always going to be a sprinter, so the 2 mile run is well suited to my run balls out fast mentality. I’m an okay biker, not great but the bike section is short and then I’m quickly on my feet again to run balls out. Win, Win, Win! I believe this is my 3rd or 4th year of participating in this race. Due to my torn tendon, things were a bit different this year. Aby stepped up to be my runner and we created a relay. MOST.FUN.EVER! We also met up with a few FNRC ladies who were also entering the world of multisport today! 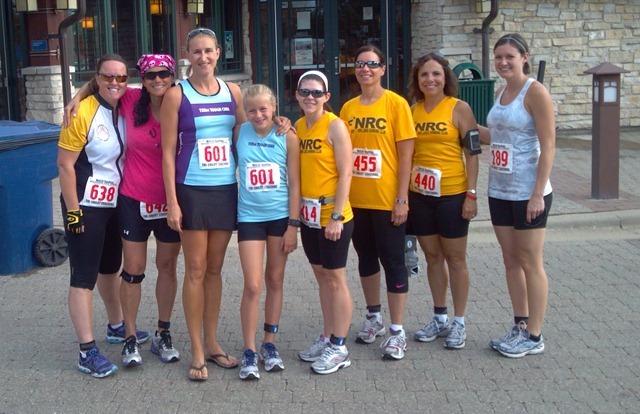 From left: Jenny, Deb, Me, Aby, Betsy, Susan, Julie, & my Ragnar partner, Kate. We got to the race early because I wanted to make sure to get a decent spot in transition and things lined up smoothly. Then the racers were off at 8am exactly. The duathlon had 4 waves, the young boys, the over 40 men, the young ladies and the over 40 ladies. Aby was lined up with the over 40 ladies since we were a team. That was perfect because I wanted her to stay relaxed in the run since she had to run 2 miles x2. Susan in gold & Aby take off at the start. She cruised those first 2 miles with a 9:27 average and I was one proud momma taking off on the bike. I must say that it was a seemingly long wait while she ran because I was so nervous she started in the last wave. When she ran into transition, most people were already out on the bike. This is the first time I have started riding this far back, but I definitely was riding on the best bike I’ve ever ridden in this event and wow, did that help. One or two years I did this on a mountain bike, one year I used a road bike, and this year I had my TRI bike. Hello Road, and it was all “on your left” from there on out. Fastest 10 miles I’ve ever ridden. I finished the 10 miles in 30 minutes & change. Yes, the course is normally 11 miles but we had a detour due to road construction this year. No big deal in my opinion and the roads were nice, mostly smooth and the turns were wide enough to not be an issue. Plus there were a lot of volunteer support to help with the bike course. Has anyone ever told you that transition matters? Well, listen up cuz it’s true. Although, I’m a veteran triathlete, I’m not a veteran relayer. I messed up. In my haste to move thru transition, weave thru those walking their bikes, I never pulled the timing chip off my ankle. So I get back to the bike rack, Aby’s waiting and instead of pulling the chip, I tried to rack my bike, then I realized my error, yanked the chip and she was off. Not sure how many seconds I wasted but every second truly does count. Today, they have awards thru 3rd place, we were 5th, we were 13 seconds out of 3rd place. If that isn’t crazy enough, the 4th place team was one tenth behind the 3rd place team. The women’s team competition from 3rd place through 7th was separated by a total of 37 seconds. Transition counts, always. Here is Aby in the home stretch chicking the dude in the orange, where she crushed the last 2 miles with a 9:32 average. Now, that’s some consistent running for a 10 year old who has only been running a year. Yes, I’m super proud!!! The run course had 2 water stop locations for each 2 mile segment. Lots of port-o-potties. Nicely organized race for people who are looking for a fitness challenge or those looking to crush some PRs. 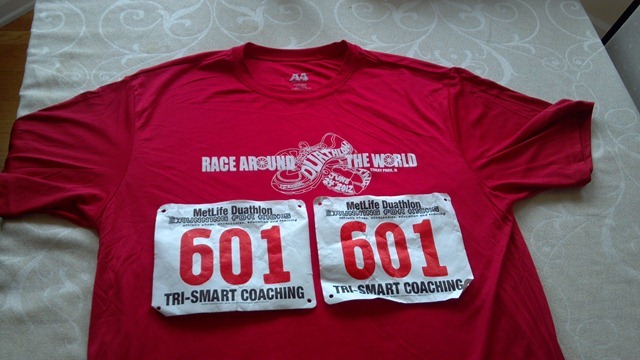 I highly recommend you checking out the The Race Around The World Duathlon for 2013. This year, if I had to complain about anything, which I don’t like to complain but in the sense of fairness need to address the fact that they did not let us pick up our shirts until after the race. So when Aby and I went to grab the shirts, they only had L & XL left. In men’s sizing. Total fail in my opinion. They shirts were great A-4 dry fit. I love the brand in a ladies fit but now I have one more shirt that I can’t wear and Aby swims in hers. It would have been nice to give this race some silent PR by hitting the trail with the shirts, or Aby wearing it to Cross Country camp, but that’;s not an option for us and I’m actually disappointed this time. The shirts looked great though, here they are below with our bibs. There was not a “goodie bag”, only the shirts. Great job to all the participants! Hope to see you out there for 2013! Who knows if Aby and I will return to do more damage as Team 2 Tough Chiks or if we will go individual next year……..stay tuned! 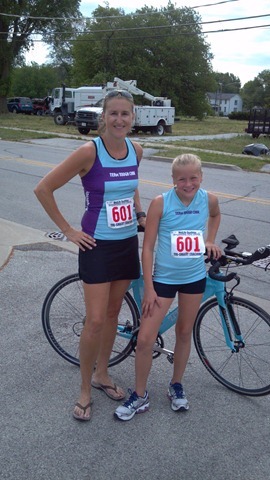 This entry was posted in Race Reviews, Running, Triathlon and tagged duathlon, FNRC, Frankfort New Lenox Running Club, Race Around the World Duathlon, Racing, Relay a Duathlon by tootallfritz. Bookmark the permalink. Way to go to both of you!! What a great way to spend the morning together!! Team 2 Tough Chicks will be Chik’n everyone on the course in no time! Great teamwork for you and Aby. Aby should be so proud of herself for being such a little competitor. 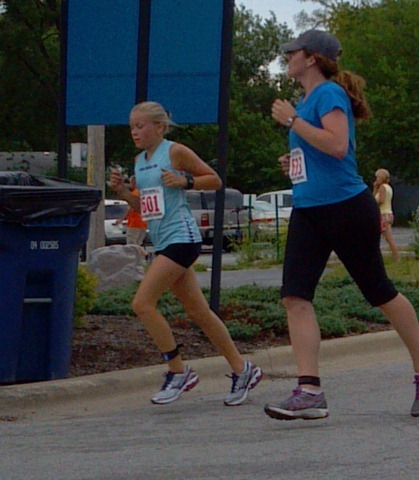 As I was running the last leg, she saw me on the turnaround (she was ahead of me!) and yelled, “Good job!” What a good little sport! And I was curious why it was called “Race Around the World,” but your guess makes good sense! The race was a fun, different way to start the day, and something I would certainly try again. And thank you for reminding me to put my helmet on during transition. You kept yelling, “Susan, helmet, helmet!” and it took a while for me to understand what that meant! Yep, I’m a newbie! They wouldn’t have let you out of transition without the helmet on, I’m sorry, I didn’t make that clear. I just wanted you to put it on so you could GOOOOOOO! Great job! Congrats to both you!!! Great Job!!! We had so much fun! And I’m so proud of Aby. She was really wiped out on the way home but she loved it! That’s awesome!!! I’m so glad to hear you were still able to compete and how fun that you were able to do it with Aby!!!!! Maybe next year I can talk my dad into doing a relay with me and he can do the bike and I’ll do the run. Or my brother. Although he’s a BMXer … would they let a BMX bike into a Duathlon??? Maggie, there are all kinds of bikes & people & ability levels. There is a spot for everyone! Come out with whatever you have! This event sounds like something I might want to try someday….yah….no water….no swimming. Will need some more advice on this transition thing….or next time just go watch one first to see how it is done. How do you make sure your bike is secure if you are out there running? Obviously it wasn’t an issue for you cause you were a team and I guess you just wait there where your bike with you or in sight. But I would be a little nervous with a $3.5k Trek Madone sitting out there all alone while I was running. Or…use another…less expensive bike. Even with the Madone I don’t think I could have averaged 20 mph, depending on the specifics of the course and how many and how tight the turns there are relative to straight-ways, not to mention road surface conditions. I wouldn’t be concerned about the time lost in transition – the real victory is you and Abby teaming up and performing well. Security for the bikes in transition is always top notch at duathlons and trialthlons. Its a big deal. They wouldn’t let anyone into transition yesterday who wasn’t wearing a bib. Some events you even need to leave your bike overnight but not at these small events. As with everything, somebody is always better, faster, stronger and there will always be bikes better, faster and more expensive than yours. Part of life. You don’t need to worry about your bike. This is a great event, you would like it! Transtion isn’t really a big deal, you just run to your bike, change shoes if you clip in, grab the bike, run it out and leave. Biggest thing to remember is to put your helmet on and to not get on the bike until you are past a certain point, the race officials make the line clear and keep telling everyone coming in and out of transtion. It’s easy, really. It was so fun, particularly the relay! Keep it in mind for 2013! Does your hubby bike? Maybe you could do the relay together? I agree. It is a race you want to do year after year. I also have a bonus because I live so close I can bike there.